Miklós Tallián caught the first flight of an Airbus A380, the largest passenger jet ever built, from Tokyo to Frankfurt. This is what it's like to fly on one of the world's most complex aircraft. —Ed. Note: The Airbus A380 is a fascinating aircraft — part of a new range of so-called "superjumbo" jets, the A380 boasts 49% more floor space than a Boeing 747-400 and has a design range of 8200 nautical miles. It entered service in October of 2007, but as the model's use has largely been limited to European and Asian routes, most Americans have not had a chance to experience it. Just over 40 have been built, at a cost of roughly $300 million each. 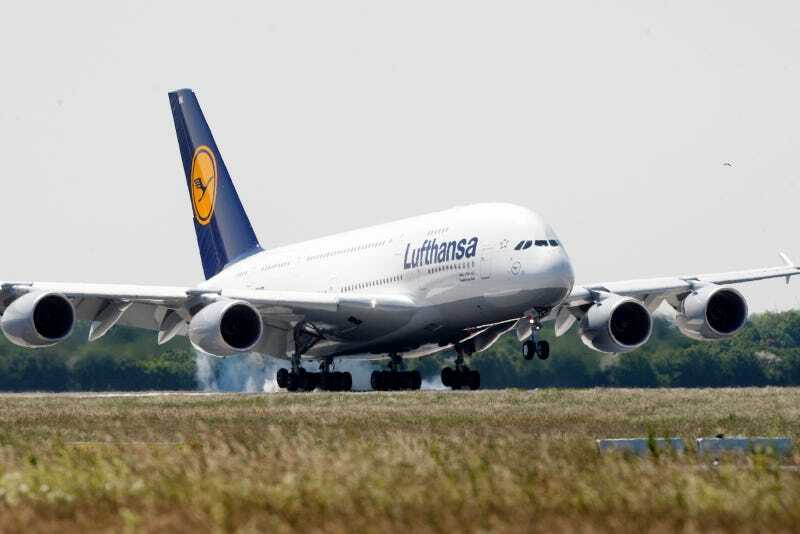 “Please cut the tape when I say ‘dozo’,” asked the Japanese lady in charge of the ceremony which took place on June 12, before the first scheduled Tokyo-Frankfurt flight of Luftansa’s flagship, the brand new A380-800 named Frankfurt am Main. And Wolfgang Mayrhuber, CEO of the airline, and his colleagues did so. Everybody applauded who was not too busy photographing and filming the plane in the sunlight. the most expensive and powerful kind in the world: the Trent 900 turbofan jet engine. Similarities to all known human-made artifacts end here. Other predecessors may include some odd, enormous flying fish like the A300-600ST Beluga supertransporter or the Super Guppy line. It’s a pity that the mother of all Hungarian thieves, Gizella Bodnár, is in jail, telling the warders that they should be happy as she guarantees their jobs. I’m pretty sure she’d appreciate the A380, as commercial aviation was a key to her career. She developed a unique modus operandi in the 1950s when domestic flights were still operated in Hungary: she flew to a city in the countryside early in the morning, committed a few burglaries, and returned to Budapest in the evening. This earned her the nickname Repülős Gizi (“Airplane Gizi”). Later on, she changed to trains and now being nearly 84 she’s eligible for free rides which makes her business even more lucrative. But I’m sure she’d be happy to make an exception and fly with such a plane to pull a job in Tokyo. saturate the senses. You’d think that once boarded this feeling would go away, but no. At 6 feet tall, I can stand up nearly perfectly straight under the overhead compartments, and I have to stretch heavily to reach the ceiling over the aisles. And even from the 71st row half of my view was blocked by the huge wing. Speaking of rows, I guess this is also a typical Lufthansa plane that does not have 13th or 17th rows. Normally I don’t like any kind of superstition but an airline’s job is to carry people not to educate them scientifically, moreover not having a 13th row is certainly a better choice than having a hysteric passenger outraged from the fact that he has an unlucky seat number. a very short and exceptionally silent run, we were airborne. As I’m not a marketing manager I wouldn’t say there was no hum from the turbines and my noise cancelling earphones were still useful. But without doubt this was the most silent aircraft I’ve ever tried, and that includes basically all types common on European routes and some bigger ones. Cruising is the same as on any long-haul flight: a meal, a movie or some reading, a short nap, snacks, another movie, arrive in Frankfurt, then disembark, but this time stay near the plane as long as possible to take pictures. And then passport control, for European Union citizens it’s possible through a completely automated gate: it scans the passport, reads the RFID data, takes a snapshot, does the facial recognition math, opens the door, and presto, I’m home. Or at least in the Schengen area. curvature of a cucumber. What is not often seen from the outside is that within a zone consisting of most of the EU countries anybody is free to move around who entered at one point, citizens don’t even need a passport: a national ID or driving license is enough. And as my grandfather would have been shot should he have tried to go near to the border without a special border-land entry permit, I highly value my freedom. After going through security again, before boarding the small and modest Boeing 737-300 bound for Budapest, I grabbed a salad and called Orosz to report my experiences. Then we came to the conclusion that with the 747 and the Concorde launched in 1969 (! ), and now the A380, there is only one thing left that we are waiting for: the first commercial passenger aircraft propelled by a scramjet. Everything else has been done already. Miklós Tallián is a nuclear physicist, businessman, and political essayist. As he spends most of his working life on airplanes, certain pairs of his physical properties cannot simultaneously be known to arbitrary precision. Photo Credit: APN Photo/Bernd Lauter, APN Photo/Mario Vedder, Manolo Gómez, AP Photo/Sven Kaestner, Angus MacRae, AP Photo/Heribert Proepper, astirn, Peter Orosz, AP Photo/Heribert Proepper, SpreePiX - Berlin. Photo of the author by Dr. Sándor Fehér.